After my time on the mongoose project I have had a go at most tasks that are essential for any good mongoose researcher such as helping to track down each pack and driving along tracks (that make you envy actual Ugandan roads) and more crucially being able to tell which one is it is I am watching (made easier by unique shaves in their fur). There is no such thing as a typical day but from my experience out here this is kind of how a day usually pans out for us and the mongooses. 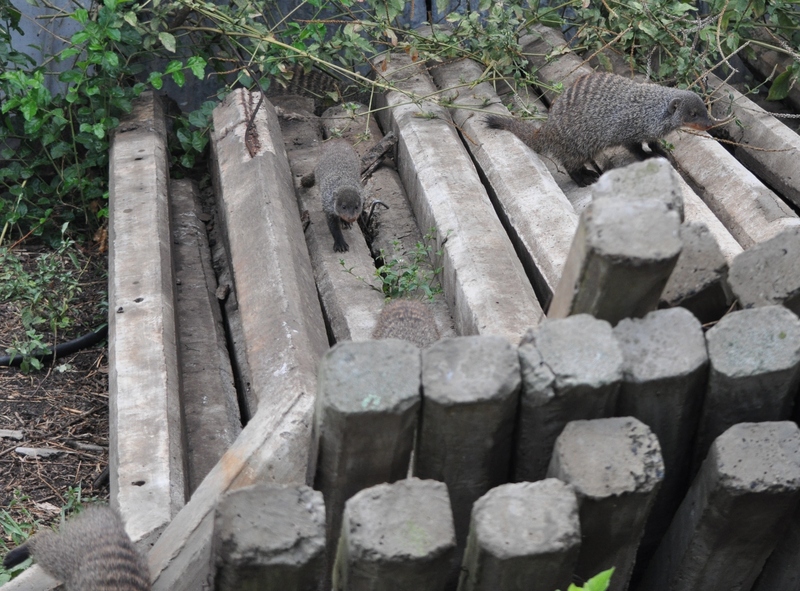 Waking up and arriving at office to plan and sort equipment for morning is all done by 8:00; which is really quite leisurely but as the mongooses don’t wake up before then, neither do we. 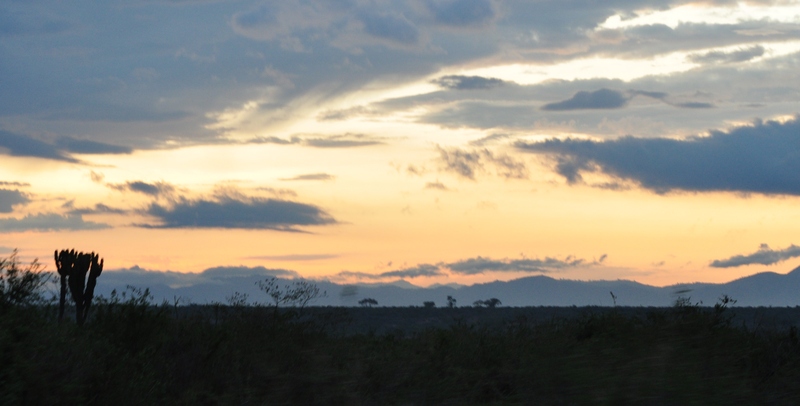 Stormy sunrise (mongooses also don’t like rain and may get up even later if cold and wet!). Each morning we meet groups just as they emerge so we can count and weigh them before they start to forage. Our resident field team make this look easy, but I have had a go with our friendliest pack 1B that apparently everyone starts with. This involves getting them to come over and trying to get them stay on the scales properly and not sitting half off! Safe to say I didn’t manage to get a single reading myself first time round and had to leave it to the experts who managed to weigh almost the entire group of 20+ in less than 10 minutes! Pack 1B is the most habituated group and owns the territory that encompasses the lodge and lot of human area. They therefore show some unusual behaviours adapted to a man-made environment. When I first waited for them to emerge I was a bit shocked to find that they had bedded down and were emerging from their den under some large concrete fence posts on a small building site. …and start a social grooming session. 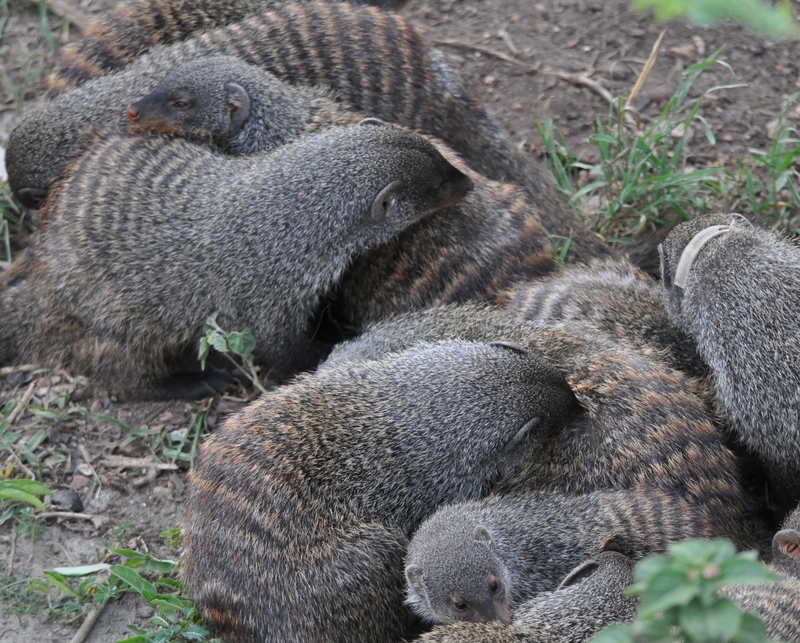 At first mongooses just stretch, huddle together and groom each other and then its off to forage. One day their breakfast seemed to arrive early in the form of a warthog (Phacochoerus africanus) that needed grooming to remove parasites. What I found interesting is that only pack 1B seem to do this, despite some other packs potentially being able to meet warthogs none of them seem to approach them, nor the warthogs either. Once we have between us visited all the groups for the initial morning checks it is time to start the foraging focals or trapping a pack to allow us to do general checkups, renew shave patches (to allow us to ID them), change the RC collars and if there are some pregnant females we take ultrasounds of the foetuses. When trapping we ensure we work as quickly as possible to gain all the data we need and release them back were we found them asap. Taking ultrasounds of the pregnant females is definitely one of my favourite parts. First you shave her belly (as the fur and trapped air would stop the scanner from being able to detect anything). You then apply a clear gel and the place the small scanner on her abdomen and move it around until you find a nice clear shot through the middle of the foetus. I was very excited to do this as I use the images to estimate foetus size for my research. Ultrasound image cross-sectional view (through the middle) of foetus to show how big it is. 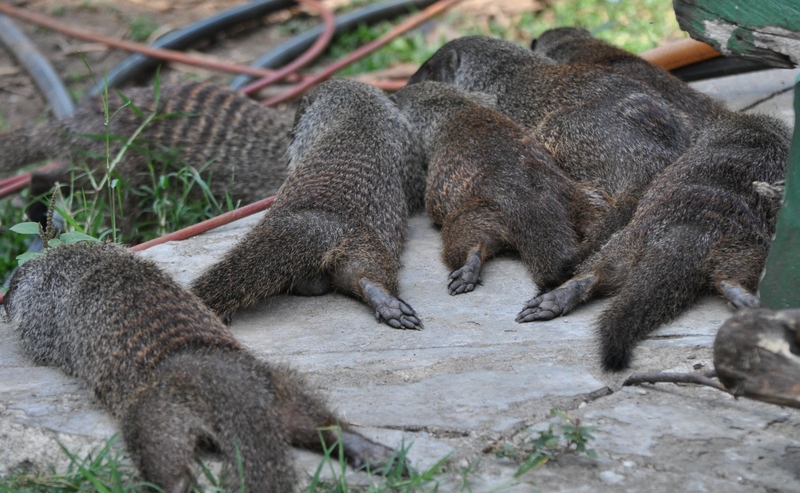 By midday, the heat and sun is too much for the mongooses and everything grinds to a stop as they sleep in the shade until about 4:30 when temperature are more tolerable. This allows us a break too to catch up on other work. We return when the mongooses are active again to finish off remaining focals, collect evening weights to compare with the morning set to see how much weight they have gained or lost during the day. After a final head count to check that everyone is still there before some very sleepy mongooses all disappear in their dens by 7:30. 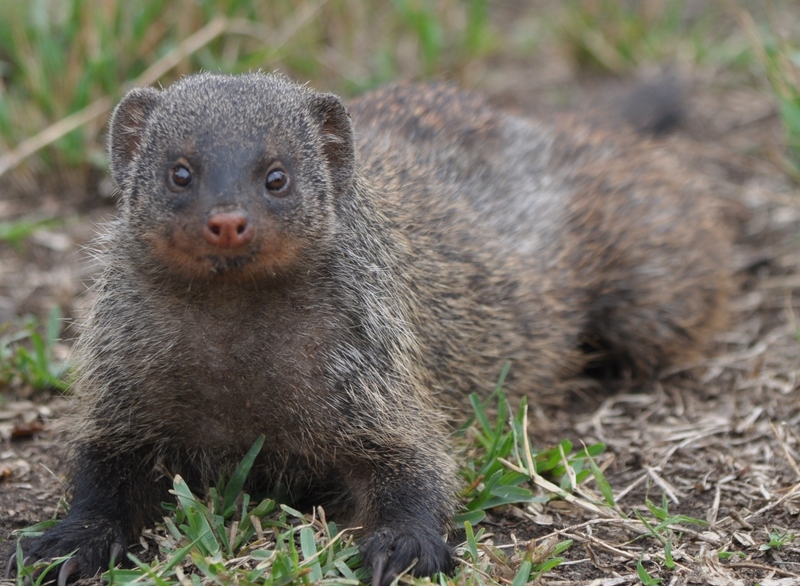 I have thoroughly enjoyed my time out here with the team and the banded mongooses and I will miss it greatly! I think now I have gained a much better insight in the world of mongooses and this should benefit my research no end. All I can say is thank you to Francis, Solomon, Robert, Kenneth and Faye for being amazing mongoosers and I hope carry on enjoying their great work with these incredible mongooses!